How to add ringtones to iPhone X/8 or how to set your favorite songs as ringtones on iPhone X/8? This guide will show you 2 methods of getting or setting custom ringtones on your iPhone X/8. Download this easy-to-use iPhone ringtones maker and transfer to your PC or Mac computer, and follow this guide to add custom ringtones to your new iPhone X or iPhone 8. The ringtone is the best thing to show people’s personality, so, many users like to set their favorite songs as ringtones. Now you get the new iPhone 8 or iPhone X, you definitely want to use your custom ringtones as soon as possible. In this guide, we will focus on this topic, and offer you quick methods to make it with ease. When it comes to adding ringtones to iPhone 8 or iPhone X, normally, iTunes is the first option. However, all the media files already on your new iPhone 8/X will be erased during this process. 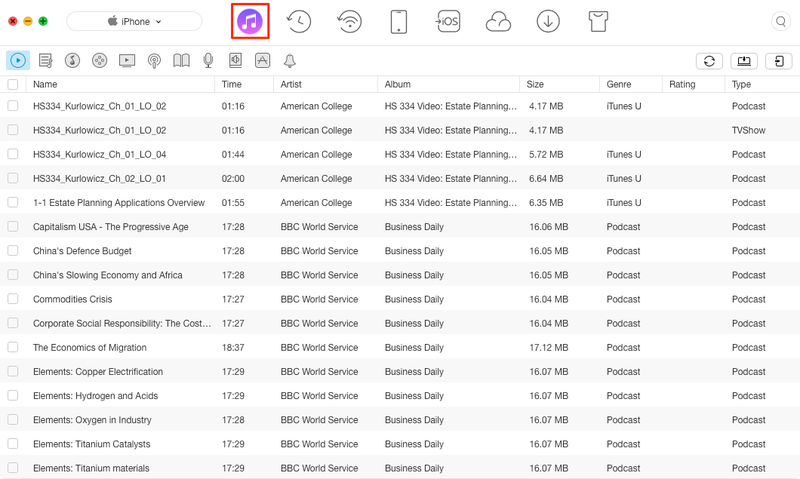 What’s more, in the latest iTunes 12.7, you just can’t find the Ringtone or Tones tab in your iTunes, because Apple has removed the ability to manage ringtones. 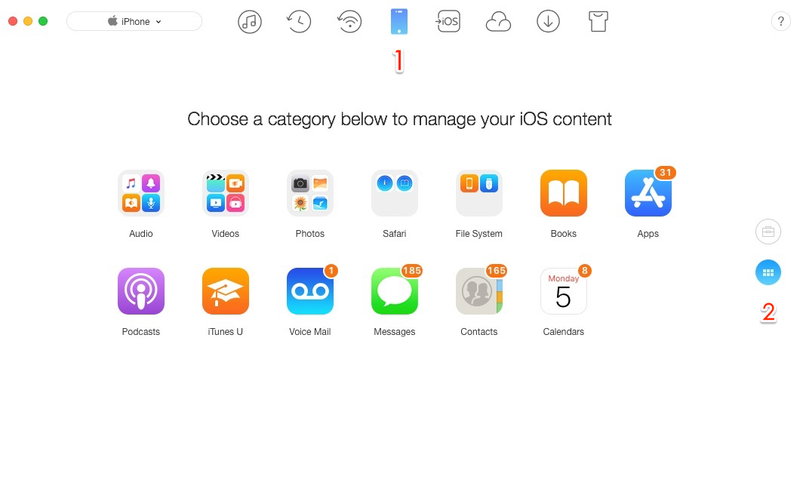 Therefore, in this guide, we will recommend you a wonderful iOS content management tool – AnyTrans for iOS. It lets you add ringtones from computer/iTunes to your new iPhone 8/X, and also allows you to make ringtones for iPhone 8/X. 1. Enough easy just like ABC, you needn’t perform the complicated creating process on iTunes. Just select and transfer the files you like to iPhone, and then they will be converted to ringtones on your iPhone automatically. 2. 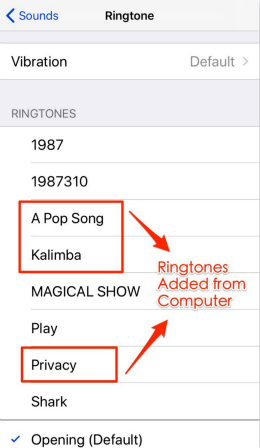 Any song, voice memos, and other audio files you like can become the ringtones on your iPhone. This means you can set any song you like as ringtones on your iPhone. All you need to do is adding them to iPhone. 3. 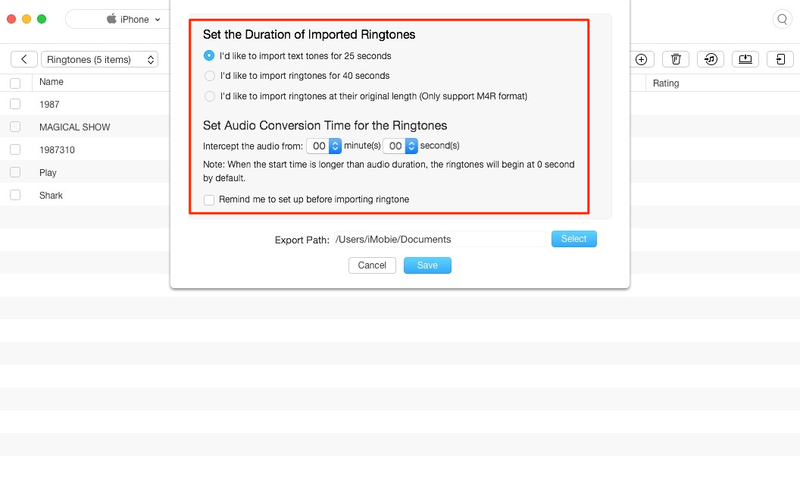 Any audio file in unsupported music formats, like mp3, m4a, wav, wma, mdi, etc., can be converted to the ringtones’ format – m4r, and become the custom ringtones on your iPhone. 4. Supports adding ringtones to iPhone from computer and iTunes library. No matter whether you are working with iTunes 12.7, you still can get ringtones from iTunes and computer to iPhone. 5. Except adding ringtones to iPhone, you also can transfer ringtones from old iPhone iPad to new iPhone 8/X, even transfer ringtones from iPhone to computer for backup. 6. Besides ringtones, other iOS contents are also supported, like Music, Photos, Videos, Messages, Contacts, Notes, etc. Next, we will show you how to Put ringtones on iPhone 8/X from computer and iTunes library. 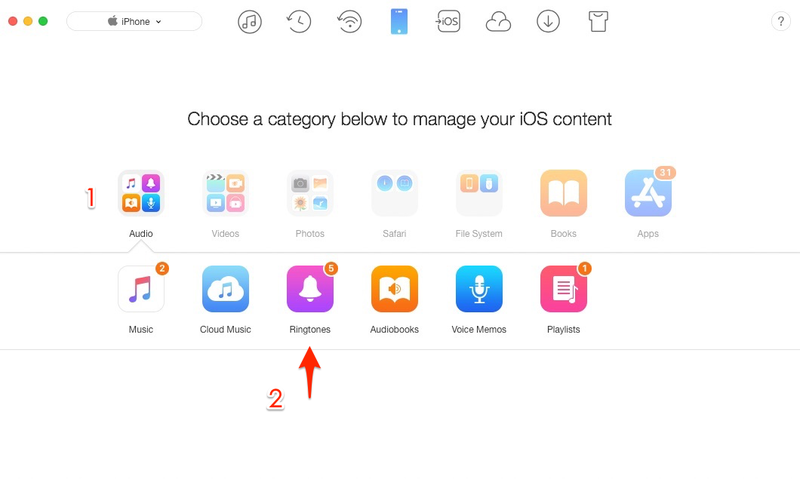 To add ringtones to iPhone 8/X from computer, no matter they are ringtones in m4r format, or songs in other formats, like mp3, m4a, wma, etc., the first thing you need to find their location, and put them in same folder, so that you can add them to iPhone 8/X at one click. Then follow us to add ringtones from computer to iPhone 8/X, or make your custom ringtones with AnyTrans for iOS. Step 1: Download AnyTrans for iOS on your computer > Connect your iPhone X/8 with USB cable > Click Device tab on the home of AnyTrans for iOS > Click the button. Step 2: Click Audio > Select Ringtones. Step 3: Click Settings button to set the duration of the ringtones or the conversion time for the ringtones > Click Save to confirm. Step 4: Click “+” button > Find the folder with ringtones or music you want to transfer > Select the ringtones/songs you like > Click Open to add ringtones to iPhone/or set custom ringtones for iPhone 8/X. 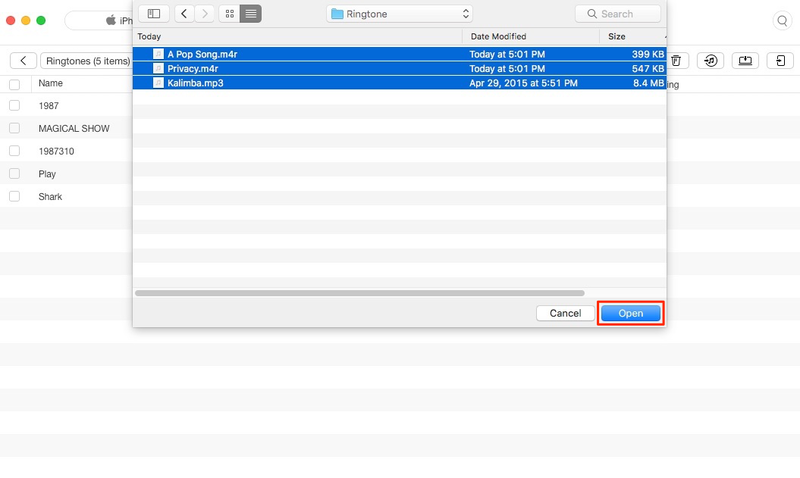 Step 5: View the transferred files, and set them as ringtones on your iPhone 8 or iPhone X. To set up ringtones on iPhone 8/X, you just need to do the following steps: Go to Settings App > Tap on Sounds > Tap on Ringtone under SOUNDS AND VIBRATION PATTERNS column > Select the one you like as the ringtone under Ringtones column. If you already upgraded to iTunes 12.7, although there is no Ringtone or Tones tab in iTunes, the ringtones in old iTunes library still store on your computer. To put these ringtones to your new iPhone 8/X, you just need to find the folder stores ringtones on your computer firstly. For Mac computer: Home > iTunes > iTunes Media > Tones. And then move to Part 1 to put these ringtones on iPhone 8/X. 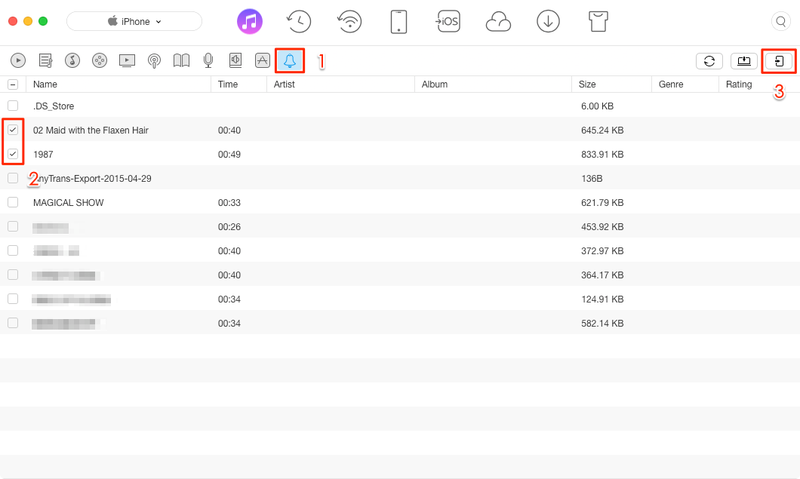 If you are still working with an old iTunes version, instead of iTunes 12.7, and have some ringtones in iTunes library, and want to sync them to iPhone 8/X, next we will show you how to make it with AnyTrans for iOS. Although you can make it with iTunes, all the existing media files like Music, Movies, TV Shows, Books will be removed during this process. Therefore, to keep all your iPhone content safe, we will recommend you to put ringtones on iPhone 8/X with AnyTrans for iOS. Step 1: Download AnyTrans for iOS on your computer > Install and Run it > Connect your iPhone to computer with USB cable > Click iTunes Library Tab. Step 2: Select Ringtones category > Select the ringtones you want to transfer to new iPhone 8/X > Click To Device button to start transferring. Step 3: Check the added ringtones on your iPhone 8 (Plus) or iPhone X, and then select one as the ringtones for incoming calls. If you want to add some songs from iTunes library to new iPhone 8 (Plus)/X as ringtones, using iTunes, you just need to export these songs from iTunes library to some folder on your computer, and move to Part 1 and follow the guide to transfer these songs to iPhone, and they will be converted to ringtones automatically during transferring.